Arctostaphylos and Mahonia deserve to be planted in more gardens. It’s a challenge to scout out new plants and introduce them to gardeners. Whether through this column, my radio program or my lectures, I have discovered that gardeners love learning about new plants. The plants I will discuss here could easily fit in many home gardens. It is a shame they are not more widely used. 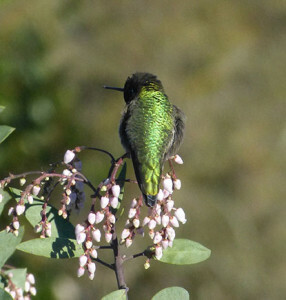 A hummingbird takes a rare rest on a specimen of Arctostaphylos manzanita ‘Dr. Hurd’. Photo by Rich Baer. On a clear January day, I visited the North Willamette Research and Extension Center in Aurora to see the Arctostaphylos (manzanita) trials of Neil Bell. Neil is a member of the OSU Extension Service and the community horticulturist for Marion and Polk counties. Arctostaphylos is native to the West Coast, from Oregon to California. As I looked over Neil’s plant trials, I came away with a new appreciation for this genus. Why, I wondered, don’t we see these plants more often in home gardens? Most Arctostaphylos selections provide some garden interest in every month of the year in our Pacific Northwest gardens. The trial plants showed an amazing diversity of plants — from leaf size and texture, to bark color and flowers. Since the region has experienced a mild winter this year, many of the plants were already coming into full bloom with clusters of urn-shaped flowers in white or pink, similar to blueberry flowers. The plants in Neil’s trial were all planted at the same time in the summer and were watered as needed until the fall rains arrived. They received no additional water and were never fertilized. They are growing in an open field with neither protection from the elements nor shade. Some of the initial plants died, others were struggling, and still others were looking spectacular. Of these trial plants, a favorite of mine for early bloom was A. ‘Sentinel’, with pink flowers on a shrub about 5 feet in height. In contrast to this, A. ‘Port Angeles’ was prostrate and seemed to me that it would be an excellent ground cover. Another favorite is A. manzanita ‘Red Stem’, an introduction by Sean Hogan from seeds he collected in the Siskiyou Mountains. True to its name, ‘Red Stem’ has flame red branches with large, shiny leaves and a growth habit of about 4 feet. Not only are the winter-blooming flowers of Arctostaphylos attractive, but they also provide an excellent source of hummingbird food. The other group of plants that should be added to more landscapes is Mahonia. Mahonia aquifolium, more often known as Oregon grape, is our state flower. Native from British Columbia to northern California, it can grow to about 6 feet in height. The leaves are glossy and resemble holly leaves — and are equally as prickly! Yellow flowers appear in clusters in early spring and, like Arctostaphylos, they are an excellent source of hummingbird food. After flowering, blue-black berries appear in clusters and provide a food source for many birds. Some varieties of Mahonia will stay in the 2–3 foot range of height. ‘Compacta’ and ‘John Muir’ are two good examples. For the garden with plenty of space, two large Mahonia — ‘Arthur Menzies’ and ‘Charity’ — can reach 10 feet or more. When these come into bloom, they can make a very dramatic statement in the garden. Not widely known but deserving of recognition is Mahonia gracilis, a native of Mexico which reaches 6–8 feet tall and nearly as wide. It certainly does not look like your average Mahonia. It has long spikes of yellow flowers appearing in late autumn and winter on red stems with smooth, soft leaves that are glossy green and appear lighter in the sun and darker in the shade. These are just a few examples of plants offering wide diversity from their genus. They should have more exposure in retail garden centers. A comment I often hear from gardeners is that they like plants to provide some color and/or texture in their gardens, and if those plants can be a hummingbird attractant and provide food to other birds as well, that is an added bonus. Display signage highlighting this feature can increase sales.